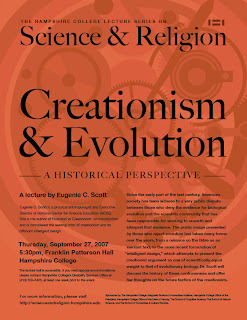 As part of Hampshire College Lecture Series on Science & Religion, we will have Dr. Eugenie C. Scott from the National Center for Science Education (NCSE) give a lecture on Creationism & Evolution: A Historical Perspective. If you live in/near western Massachusetts, please join us at the lecture. As usual, we will also be recording the lecture and I will post the video when its available.